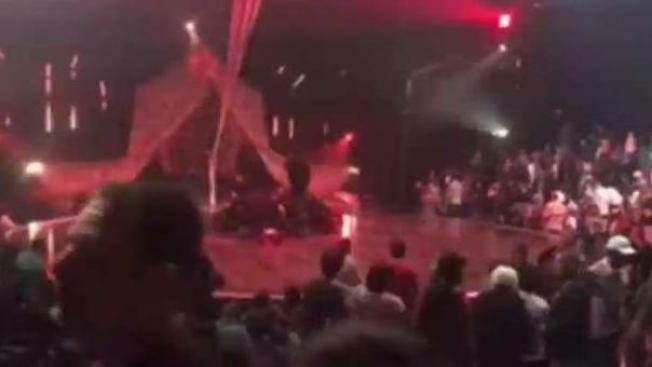 Cirque Du Soleil Acrobat Dies After 'Horrifying Drop' in Fla.
A performer fell to the ground during a show in Tampa. The show was cancelled and the performer was transported to the hospital. A Cirque du Soleil acrobat who was injured after falling onto the stage during a show in Tampa died Sunday, a statement from the entertainment group confirmed. Yann Arnaud, an aerialist who was performing during a March 17 production of VOLTA, died from his injuries in the hospital, the company said. "The entire Cirque du Soleil family is in shock and devastated by this tragedy," Daniel Lamarre, president and CEO of the company, said in the statement. "Yann had been with us for over 15 years and was loved by all who had the chance to know him. Over the coming days and weeks, our focus will be on supporting Yann’s family and our employees, especially the VOLTA team, as we go through these difficult times together." WFLA reported the aerial strap artist fell in a "horrifying drop" during his number. The show was canceled and Arnaud was transported to a nearby hospital. The last two shows of VOLTA in Tampa were canceled, according to the company. The shows were scheduled to take place on March 18 at 1:30 p.m. and 4 p.m. Anyone who purchased tickets through the Cirque du Soleil website or call center will receive an automatic refund on their credit card, while anyone who purchased a ticket through another vendor will have to contact the original point of sale for a refund, the company stated. Cirque du Soleil said they are gathering more information about the tragic incident and are working with authorities to determine the circumstances of the accident.